The Brickyard and The Jolly Monk, both in Hell's Kitchen, have closed. 'Tis 'Beerly Legal' to have so many great craft offerings. No cash at this new brewpub that serves great beer. Serve yourself if you so desire. A great place off most people's 'beer radar'. 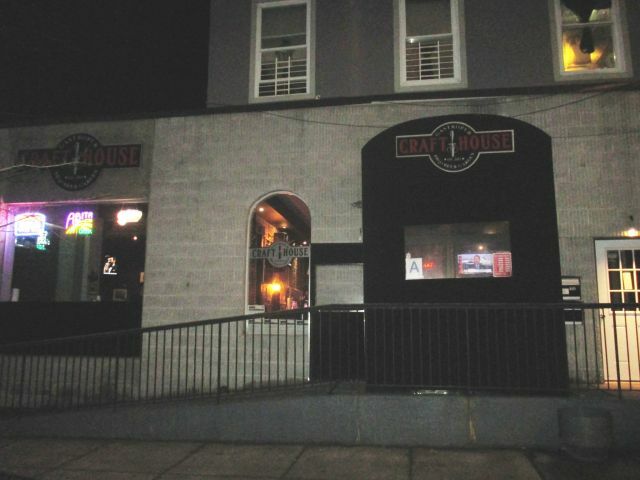 DBGB is no more, just like the former CBGB punk rock venue which it was named after. Excellent, innovative beers from brewing legend Chris Cuzme - added to this guide with pleasure! A big loss for Greenpoint. In Forest Hillls, Queens, an unlikely off-the-beaten-path beer destination is added. 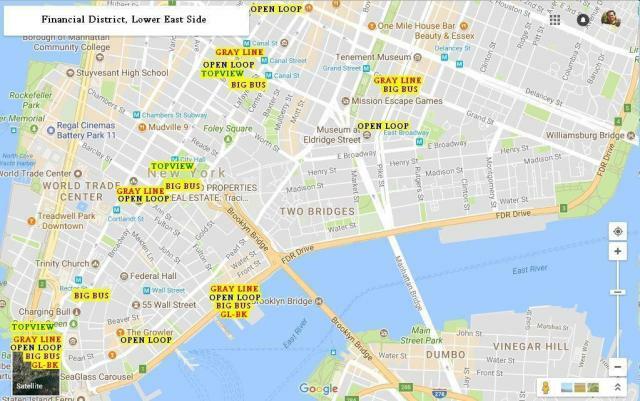 Delaware and Hudson, in Williamsburg, has been found to have a good craft range and is duly added to the database. The Sampler (Starr Street, Bushwick) is closed at the time of writing. It is apparently to re-open at some point, but it is unknown if the name and format will be unchanged. 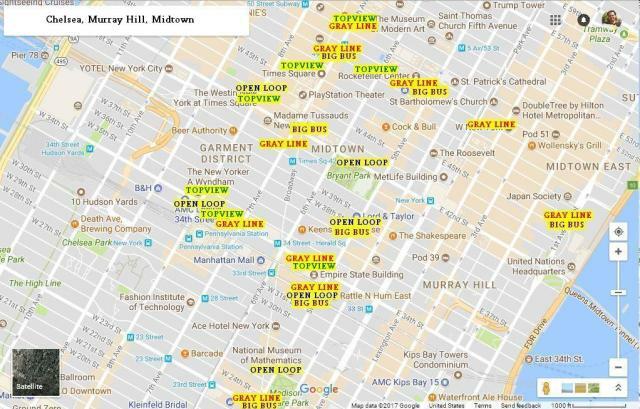 Here is a map showing where the sightseeing buses from each operator stop in this area (downtown routes only, the uptown routes are not suitable for hop-on hop-off pub visits). 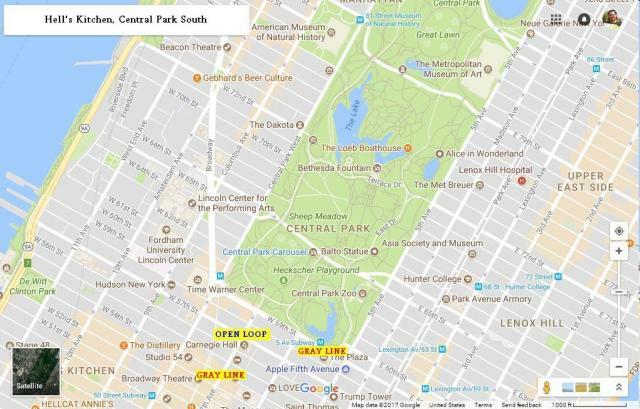 They are colour coded: Gray Line=red, Big Bus=purple, Open Loop=blue, Top View=green. Locations of recommended pubs and restaurants are not shown on these maps, see the main map or locality maps. 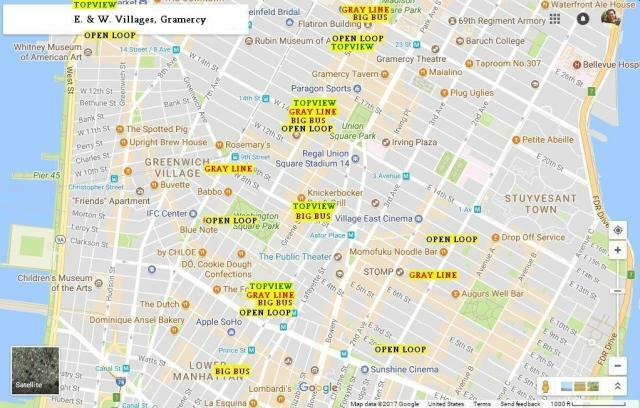 Here is a map showing where the sightseeing buses from each operator stop in this area. They are colour coded: Gray Line=red, Big Bus=purple, Open Loop=blue, Top View=green. Locations of recommended pubs and restaurants are not shown on these maps, see the main map or locality maps. St. Andrews, near Times Square, closed permanently during the summer. The new sister bar-bowling alley to the original Gutter in Williamsburg has been added. I had known about this for a week (when the gate notice photo was taken), but didn't want to report on it without all the facts. Today, Gothamist revealed all. See http://gothamist.com/2017/08/28/rip_jimmys_no_43.php - this is a very huge loss if a financier can't be found. Death Ave, a quirky Greek-inspired restaurant which previously boasted at least four casks pouring, has had another reinvention (this time very good, last time bad when they ceased pouring the casks). It is now a brewpub with six beers on tap brewed in-house. This is a reinstatement to this guide. The beer names are appropriate matches for the style, prefixed 'Mr.' The sour 'Mr. Rancid' is anything but though, puckering but not rancid. A brilliant name by a bold brewer! Updated entry. The Monk is now Cafe Monk. There is new ownership for The Monk, located in Ridgewood, Queens. There have been some changes, including the name. The beer range was still good on my last visit, however some brands are being shuffled. Time will tell. The tiny bar serving as ICONYC's taproom has been added. The shared taproom space of Lineup and Wartega has been added. 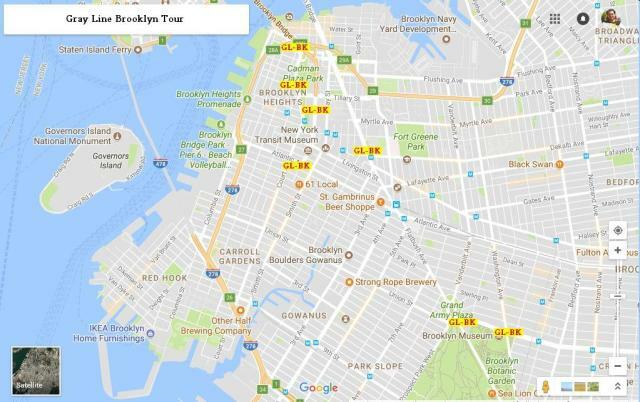 New Guide Entry: Five Boroughs Brewing Co. The sizeable Five Boroughs Brewing Company (30BBL brewery and taproom) has opened in Sunset Park. Long Island City's Re Pub LIC is no more. This started up as Open Door. New Guide Entry: Circa Brewing Co.
Brooklyn has a new brewpub opening today. 12 good quality beers are on tap. LaGuardia Airport has a multi-tap restaurant airside at terminal D. No less than 37 craft beers flow - who would have thought something like this could be found in an airport? A sad loss to the NYC beer scene is the closure of the original Pony Bar in Hell's Kitchen, which poured its last beers yesterday (5th February 2017). Thankfully, the Upper East Side location remains open. The photo below shows the bartenders on the last afternoon, suitably attired. The sister bar of the original Arts and Crafts in the West Village has been added. The location is next to Columbia University. This tiny hybrid bar and store has been added with a 'highly commended' blue tick icon. The taproom at Folksbier in Carroll Gardens, Brooklyn, has opened and is duly added here. The South Bronx is coming around with the late 2016 opening of this smart bar-restaurant. Staten Island is coming around! A brewery is being installed here too. Flying the flag for 25 years on Staten Island, but only just reviewed due to location pains from where I live. Mmm, Allgash Tripel and other good stuff on tap. Better than before, hence it goes back on here. "Holland House will be closed for renovations for an undisclosed period of time" says their website. This Midtown beer hall is therefore deleted from this guide. Rockaway Brewing Company, based in Long Island City, have opened a quirky, community supporting outlet out in the Rockaways - and this is duly added to the guide. Previously, the area was a total craft beer desert. Straight in with a blue star (top recommendation) is Gebhard's Beer Culture on West 72nd Street, the sister place to the original Beer Culture on West 45th Street. 15 craft taps, 283 craft bottles and cans, plus (coming soon) a cask ale. This new joint brewing and distilling operation in East Williamsburg has been added. Bushwick's first bricks-and-mortar brewery (and taproom) in 40 years has been added. Beer Closet in Long Island City is closed and has brown paper lining the windows, so is deleted from this site. It sadly only lasted a few months as a hybrid bar and store. Precious Metal, a former yoga studio and slaughterhouse (not at the same time! ), has been added. Fifth Hammer Brewing Company have recently received the keys to their forthcoming brewery and taproom at 10-28 46th Avenue in Long Island City. Congratulations to partners Chris Cuzme and David Scharfstein! They are aiming to open in early 2017, according to reports. Biblio in Williamsburg and Pigalle near Times Square have both bitten the dust. I have deleted their entries on here. This new joint brewing and distilling operation is now in production in East Williamsburg. The taproom comes soon. Congratulations to Kings County Brewers Collective for launching their first beers in the local market. This small hybrid place enters the guide with a blue tick recommendation. World of Beer has closed after only a few months, however word on the grapevine says it could reopen (unknown if under the same name or format, or something different). This excellent bar has been open a few months, it has now gone into the guide with a blue tick recommendation. Entry updated accordingly. Also, they sometimes put on live music - the relevant icon is added. This New York State-only bar in Clinton Hill opened yesterday and is duly added. No frills craft bar, another good beer destination opens in Hell's Kitchen. Thin crust pizza meets craft beer in the former Brooklyn Waterfront Ale House space. Lupulo, Portuguese for hops, is a new entry with a blue tick. New Brewery Addition: ICONYC. Also two new forthcomings added. ICONYC, the so far rather elusive new brewery in Long Island City, is now added to the brewery section. There is no taproom. Wartega and Lineup are two new start-ups which plan to share the same space in Brooklyn. Damn! That place was good. Brouwerij Lane has a new manager, upgraded to blue star (as in don't miss!). Kim Mercado, of TÃ¸rst fame, is now managing Brouwerij Lane. It didn't take long for the place to be upgraded to blue star, as the tap range is out of this world. Initially opened as just a beer store, Beer Closet has just been transformed into a very cool bar-store hybrid. There are over 200 craft beers in bottles and cans to choose from, with keg taps coming soon. I gave this an 'honourable mention' blue tick. A very welcome new place to hang out in Long Island City. Banter now has a cask engine, upgraded to blue star recommendation. The recently opened Bottle and Bine has been added with a 'blue tick' honourable mention from me. The rotating tap list is well chosen, check this place out. Keg & Lantern Brewing Company and Jones Wood Foundry have both reapplied for Cask Marque, and have passed. They are accredited for the rest of 2016, and the icon on their respective pages is duly reinstated. Opened today, straight in as a top pick (blue star). Very impressed. The Wilky is a new beer bar in far eastern Bedford-Stuyvesant, bringing good craft beers to an area previously lacking in that department. We wish them the best of luck for the future. The new incarnation of Chelsea Brewery, formerly a brewpub on Chelsea Piers in Manhattan, will open to the public on Saturday 9th January 2016. Located in The Bronx, this is a production brewery rather than a brewpub - but there is a taproom area with plenty of seating. Note the review and accompanying photos were done a few days before opening, but several weeks after brewing commenced. I've had to pull the icons from three bars Cask Marque accredited which didn't renew for Jan-Dec 2016. The new sister bar to District Tap House is now open. We no longer recommend this place due to service issues. New Guide Entry: Coney Island Brewing Co. The rebuilt Coney Island Brewery opened in August, and is duly added (better late than never). 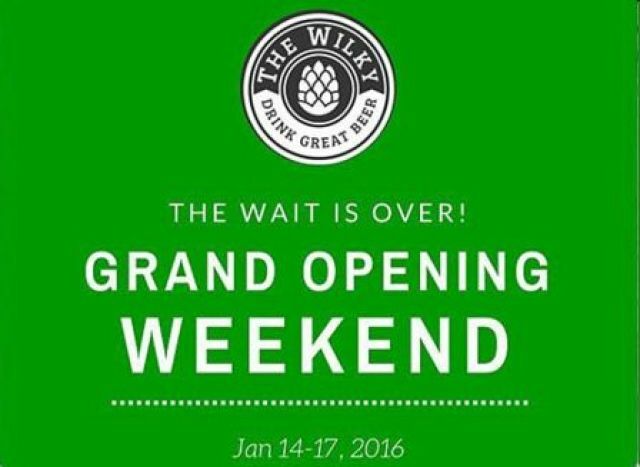 NYC's latest brewery and taproom opens officially to the public on 17th December 2015. This excellent hybrid bar and store is added with an 'honourable mention' tag. The number of worthy places to visit in Long Island City has grown with the addition of The Baroness. Rattle 'n' Hum West, sister bar to the original Rattle 'n' Hum near the Empire State Building, opened on 2nd December 2015. It is located just off 8th Avenue, near the Port Authority Bus Terminal. Before this site has even been officially launched, with a heavy heart I have had to pull pioneering craft and cask beer bar 'dba' from the listings. Founded by the late Ray Deter and Dennis Zentek in the 1990s, this was an early mecca for lovers of good beer in the early days of the craft beer revolution. Following on from the untimely passing of Ray, then Dennis, the bar was sold in 2014. Despite promising to keep it going unchanged (apart from a welcome tidying up), the knowlegeable beer manager was laid off after a few months and the range took an instant nosedive into the low altitude of a mix of cheap swill and the most basic craft kegs. There are no casks anymore apparently. This is the original 'dba', there was a second in Brooklyn which closed in 2014. Another 'dba' still exists in New Orleans, which should still be good. Ray and Dennis had a motto for the bar: 'Drink Good Stuff'. It's too bad the new owner has sadly eschewed that phrase. We have some good news to report, the start-up Kings County Brewing Collective (KCBC) have just signed the lease to an industrial building at 381 Troutman Street, Brooklyn NY 11237. This is in the heart of Bushwick, and very close to the top-picked Sampler beer bar and bottle shop. Congratulations to all at KCBC, cheers!